Registration is required for all programs. Please stop in at the Front Desk or call the Library at 815-939-1696 to reserve your spot. Create houses, monsters, or futuristic vehicles with our Legos and your imaginations. Join others who like doing the same thing at our Lego building session. This event is for kids in Kindergarten and older. Tuesday, February 17th & Thursday, February 19th, 10:00 – 11:00 A.M., Tiny Explorers Join us for a morning program specifically for children 6 months to 5 years old. Parents and Guardians come along for this new program a chance for kids of all ages to play and build using age-appropriate manipulatives. It is a great time of socialization and play. Storytime is a mix of crafts, stories, music and snacks to help young children develop a love for reading. Parents and guardians can bring their 6-months to five-year-old children. 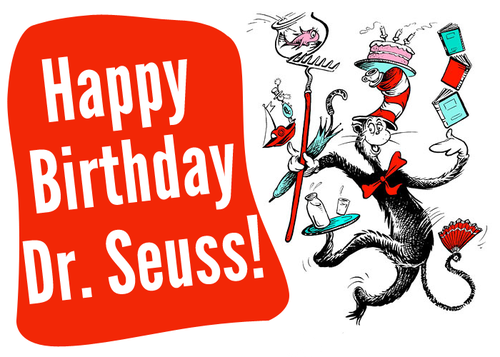 Friends of the Limestone Township Library present their annual Dr.Seuss Birthday Party on Saturday, March 7th from 1:00 - 2:30 P.M. We plan to celebrate by playing WACKY Games, designing a WACKY hat, hearing a WACKY interactive story, and taking home a WACKY treat! Kids of all ages are invited to attend. Reserve your spot by calling the Library at 815-939-1696 and registering today! 2701 W. Tower Road or call us at 815-939-1696.